CEBU’s Luis Miguel “Igimax” Maximo secured the third over-all spot of the men’s 16-19 age group of the Powerade Philippine Duathlon Series last Aug. 19 in Sta. Rosa, Laguna. The 17-year-old Maximo completed a grueling seven-kilometer run, 35-km bike and 3.5-km run in one hour and 56 minutes. “It’s not easy to compete for a series event because you lose points if you miss a leg,” said Maximo, a PHL junior national cycling team member. Due to the demands of travel and logistical support, Maximo missed the first leg but was able to make it up in the next two legs. “I hope to complete the fourth and final leg this October and maintain my standing. 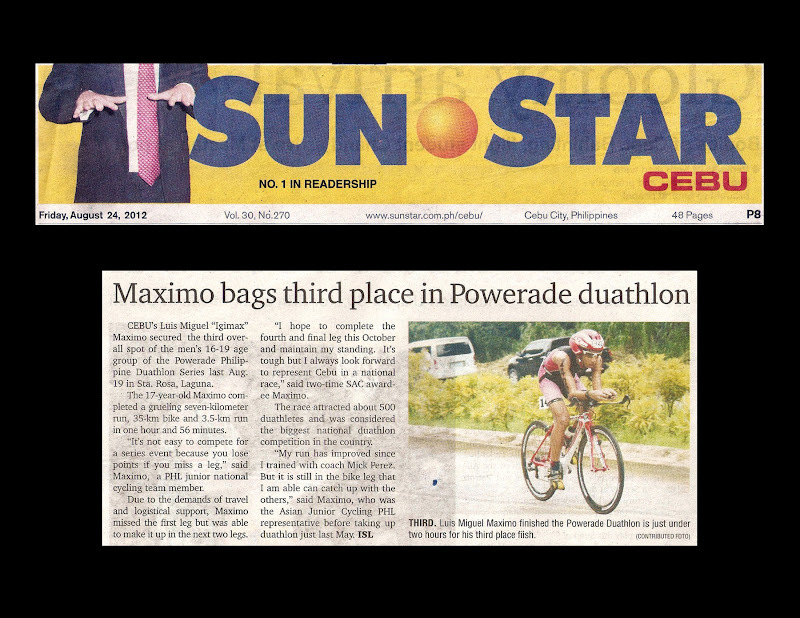 It’s tough but I always look forward to represent Cebu in a national race,” said two-time SAC awardee Maximo. The race attracted about 500 duathletes and was considered the biggest national duathlon competition in the country. “My run has improved since I trained with coach Mick Perez. But it is still in the bike leg that I am able can catch up with the others,” said Maximo, who was the Asian Junior Cycling PHL representative before taking up duathlon just last May. Published in the Sun.Star Cebu newspaper on August 24, 2012.